The Fellowship was fortunate enough to obtain a copy of WORLD OF TANKS #1 from Dark Horse Comics. Garth Ennis writes, Carlos Ezquerra draws, Michael Atiyeh colors, and Rob Steen letters. A British tank unit lands at Normandy a month after D-Day, ready to help push Jerry back to Berlin. Linnet and his crew haven’t seen any combat yet, but they’re eager enough. Unfortunately for them, the Germans still have some fight left in them, and they also have some pretty impressive hardware. The question is can they keep their tanks together long enough to find help before the Brits do them in. This is a story about two opposing unit commanders trying to do their jobs, which is keeping their men and gear in one piece long enough to count as a victory. Ennis is well known for his war stories, and this has all the makings of another great one. The art also really helps to sell the gritty reality of war. They say war is hell, and driving around Europe in the summer in thick metal boxes probably isn’t helping that feeling for either set of chaps. This story will come down to a battle of wits, and it looks to be a good one. Check it out. 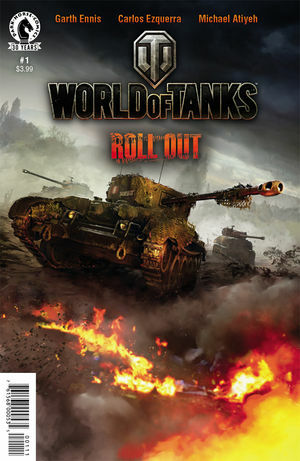 WORLD OF TANKS #1 is available now at your FLCS or at darkhorse.com.